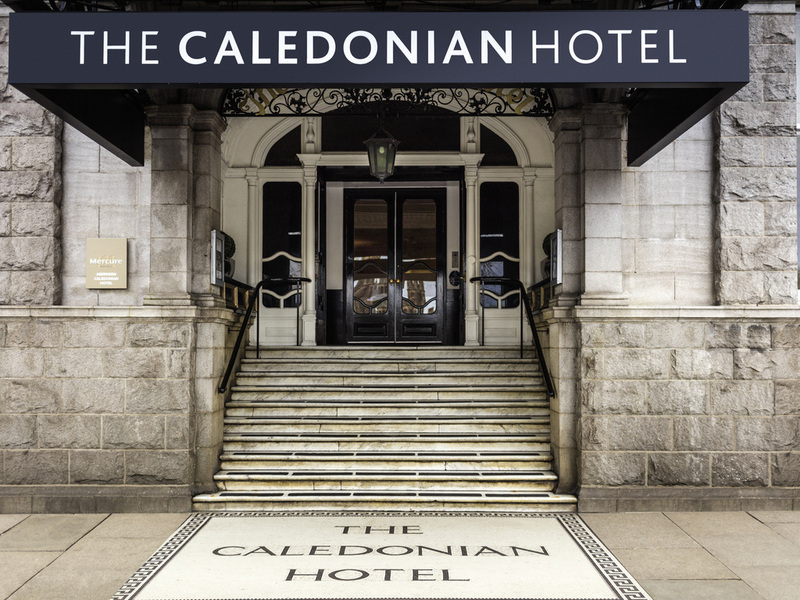 Mercure Aberdeen Caledonian is an elegant Victorian hotel overlooking Union Terrace Gardens in the city centre. The locally-inspired design, with its Renaissance style of architecture in white Kemnay granite with stained glass windows, reflects Aberdeen's rich and varied heritage - from the harbour and beach to the many beautiful castles with their colourful histories. Located in the city centre, the hotel is ideal for guests attending for both business and leisure. Guests can enjoy afternoon tea, a snack or a light meal in the elegant Bistro restaurant. Relax and unwind with a selection of international dishes cooked to perfection by our chef, before grabbing yourself a drink or two at the bar. Away from the hotel, guests can experience the majesty of Union Terrace Gardens. The main train station is just a ten-minute walk away, while Aberdeen's old fishing Village, Fittie, is just a short distance further. From the A90, follow signs for the city center and Union Street. Half way down the main thoroughfare, turn left on to Union Terrace, Mercure Aberdeen Caledonian Hotel is on the left after approximately 100 yards. At Mercure Aberdeen Caledonian Hotel, we have 83 bedrooms, including Deluxe rooms and Suites. All of our bedrooms include free unlimited WiFi, coffee and tea making facilities, flat screen TV, hairdryer, iron and ironing board. The room was very clean but very hot. The heating was on full when we arrived. The staff were all very friendly and helpful. The breakfast was OK.
Short business stay in the heart of Aberdeen, friendly staff, good service. All staff were welcoming and pleasant, professional and helped if needed. Our room however, was sadly lack, out dated and cold, we had industrial fans in the room, beds that moved everywhere and it was a similar story with the decor, ceiling was in bad need of painting and it needed a new carpet. Especially for the price paid for a hotel in Aberdeen, we could of chosen another hotel that was cheaper and would of been a lot more up to date. Perfectly located hotel with good rooms. Great location. Super hotel at a great price. Helpful staff, nice room with views. Room was comfortable and suited our needs. Had a good nights sleep on a comfortable bed. Check in/out was smooth. Last minute stay for 1 required. Apart from stained seat the room was fine. Breakfast was nice but service could have been better especially as it wasn't busy, e.g. I had to go up to the staff to get more coffee and water. Also it wasn't made clear if you to pay extra for the cooked breakfast options on the menu, e.g. eggs benedict. Have stayed here on a few occasions but would have to say I was not satisfied with my recent stay. The cleanliness of the room could have been better. We were given room 221 where we found a fingernail on the carpet by the window, there was something also broken off the window, carpet stains and bed side tables heavily stained. Experience was average. Hotel and rooms in obvious need of a freshen up. Didn't expect to have to pay for car parking. Stayed three nights in a double deluxe room, and apart from a rather small bed for such a large room, we had a great time. Room was clean and tidy, the bathroom was very nice for what is a rather old building. Breakfast and hotel service was very good. Welcomed with a big smile, hotel room and facilities are excellent. Room and services were very good but the £10.00 parking fee came as a shock and is highly over priced. Simply spoiled an otherwise good stay. Chef Ross Stewart A. CPSE WACS AAC A. My go to place to stay in Aberdeen, I cannot Express enough Thanks to the excellent Staff, Management and Service. I will return again in August for another months stay! Thank you!! Excellent service, free upgrade, good breakfast and accommodation of a high standard. Hotel was nice, reasonable prices and clean.